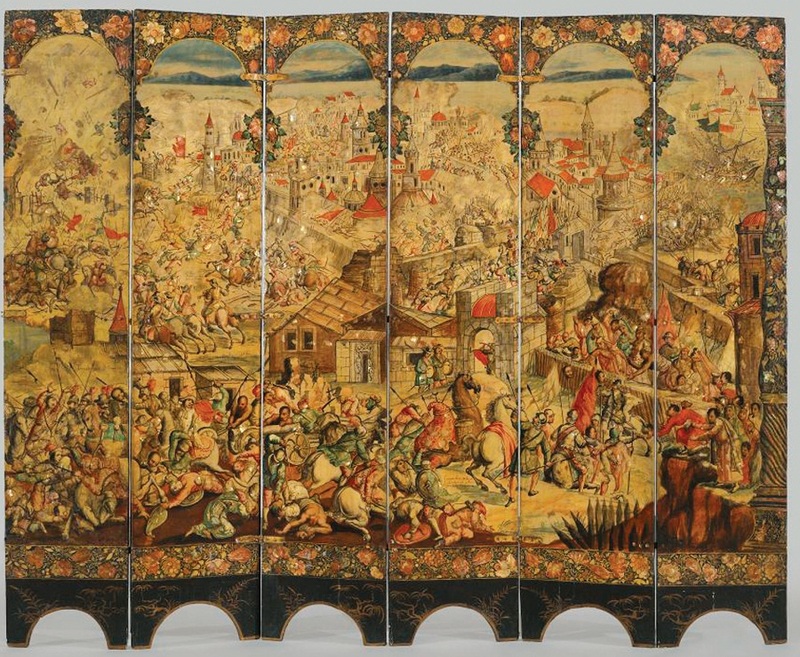 Folding screen with the Siege of Belgrade (front), Mexican, c. 1697–1701. Oil on wood, inlaid with mother-of-pearl. Brooklyn Museum, gift of Lilla Brown in memory of her husband, John W. Brown, by exchange. Objects in gold and silver, inlaid and gilded furniture, sumptuous fabrics, Asian porcelains, dazzling por­traits-the Spanish colonial elite had it all, and flaunted it proudly within the confines of their private houses. Though surviving in relatively large numbers, these riches have been largely un­derstudied until recently but are now enjoying a renais­sance in collecting and scholarship. Drawing on its own strong holdings (supplemented by loans from the Hispanic Society of America, the Metropolitan Museum of Art, the Colección Patricia Phelps de Cisneros, Roberta and Richard Huber, and other private collectors), the Brooklyn Museum has organized a traveling exhibition that celebrates the co­lonial home as a principal repository for these arts. The show and its excellent accompanying catalogue ex­plore how Spanish Americans-by the eighteenth century, among the world’s wealthiest people-used these objects of conspicuous consumption as displays of power with­in their houses. The extraordinary mother-of-pearl-inlaid Mexican folding screen shown here, for example, commis­sioned by the viceroy of New Spain about 1700, is examined for the first time in its original domestic context, separating a grand reception room from a more intimate women’s sit­ting room or state bedroom. Doña María de los Dolores Gutiérrez del Mazo y Pérez by José Campeche (1751–1809), c. 1796. Oil on canvas. Brooklyn Museum, Lilla Brown gift in memory of her husband, by exchange.